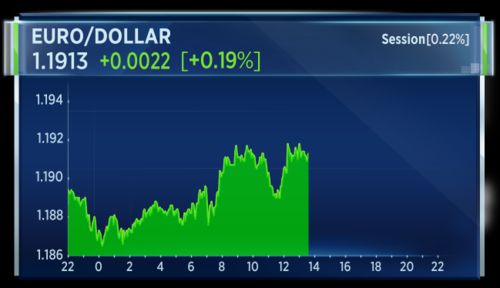 The dollar is broadly higher after the Federal Reserve hinted at one last rate hike this year, most likely in December. 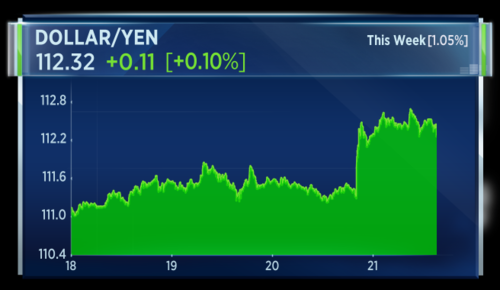 Meanwhile, the Bank of Japan announced this morning it would hold rates steady, which helped push the dollar to a 2-month high against the Japanese yen. 9 years and 4 and a half trillion dollars later - the Fed starts unwinding its balance sheet. 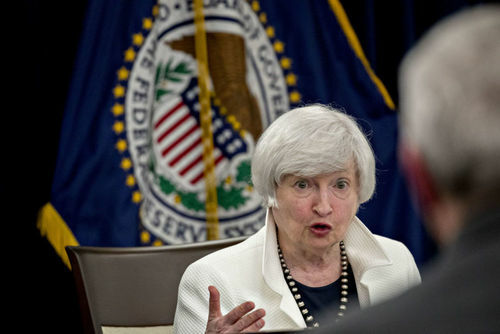 Chair Janet Yellen sticks to the rate hike path, amid speculation over her future. The Bank of Japan holds steady, but is surprised by a lone dissenter, who argues current policy won't do enough to get inflation up to the target. Unicredit reportedly eyes Commerzbank in a merger that could create one of Europe's largest lenders, sending shares in the German bank higher into the close. Google puts $1.1 billion in cash on the table for HTC's smartphone unit, despite the Taiwanese firm losing market share to Apple, Samsung and other rivals. The Federal Reserve has pulled the trigger on unwinding quantitative easing. 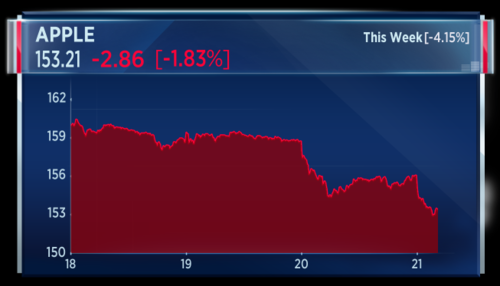 Chair Janet Yellen announced the central bank would begin reducing its balance sheet from next month. This month, policy-makers held rates steady but left the door open for another rise, with September's dot plot showing conviction for one more hike this year and 3 more in 2018. 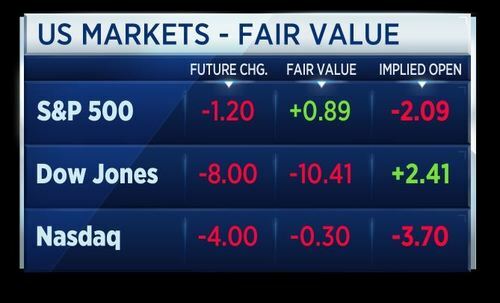 Let's look at some market reaction to the Fed decision. Yields rose across the board with the 2 year yield hitting its highest level since 2008. Financial stocks got a big boost following the rise in yields, with the S&P Financial sector rising to its highest close since the start of the financial crisis in 2007. 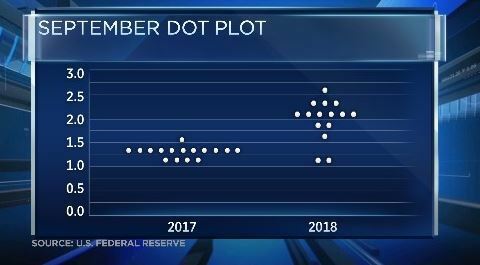 The Federal Reserve's latest dot plot graph, indicating the central bank expects to raise interest rates one more time this year. The Fed on Wednesday kept its benchmark rate steady and said it will begin shrinking its balance sheet from October. 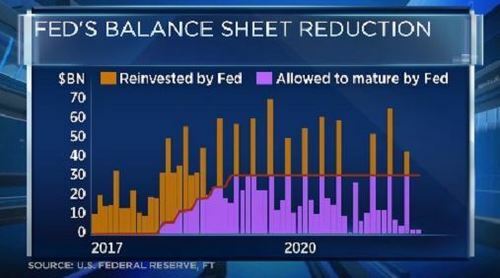 Here's how the Fed plans to reduce its balance sheet. 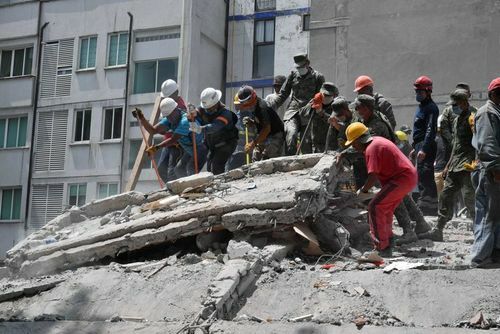 Mexico has declared three days of national mourning following the 7.1 earthquake which killed at least 230 people. Emergency crews are now sifting through the rubble in the hope of finding survivors, aided by reinforcements from around the world. Dozens of buildings have been toppled or damaged and at one point, nearly 5 million homes and businesses were without power. Meanwhile, Puerto Rico is under a curfew as the island begins the recovery process following Hurricane Maria. The storm is still packing 110 mile per hour winds. Forecasters expect Maria to strengthen during the next few days as it turns North. Demonstrators took to the streets of Barcelona to protest moves by Spanish officials to halt a banned referendum on Catalonian independence. The demonstration led to detentions and scuffles between police and protesters. This after state police raided Catalan government offices and arrested officials, including the region's junior economy minister. Catalan president Carles Puigdemont has called for a democratic response from the region. Every vote counts. That was the message from German Chancellor Angela Merkel speaking at a campaign event in Hamburg. 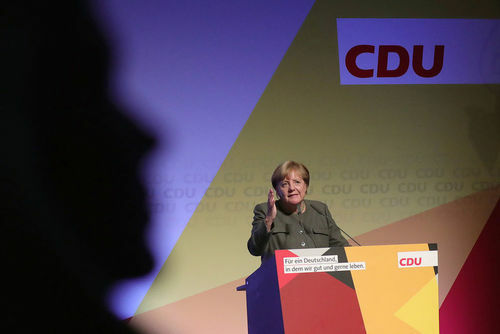 Merkel has been looking to bolster support to give her an upper hand in coalition negotiations, with many expecting the outcome of the election to lead to another grand coalition with the CDU's biggest opposition party. Her rival, Martin Schulz meanwhile has urged any voters looking to remove Merkel as Chancellor to use their votes for the SPD. Here's the latest polling data ahead of the vote. The Swiss governments sees 2017 GDP growing at 0.9 percent, down from its previous forecast of 1.4 percent. 2018 GDP growth is seen at 2 percent and inflation at 0.2 percent. The government says the Swiss economy is only gradually returning to dynamic growth path. 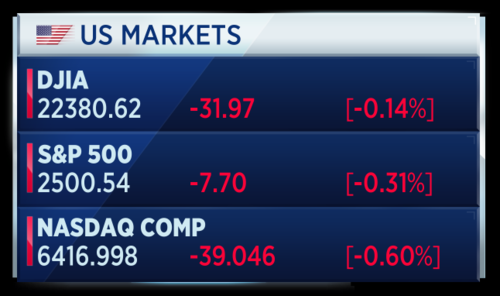 In a busy week for market-moving news, our Trader Poll is asking: Who is under the most pressure right now? Angela Merkel, Theresa May, Janet Yellen, or Kim Jong Un? In this week's Trader Poll, we want to know which world leader is under the most pressure. Corner stores are trying to fight back against Amazon and other retail start-ups that threaten to close them down. A start-up in New York, founded by two ex-Google executives, faced public backlash last week when it launched a vending machine device that was widely criticised as a "corner shop killer". Amazon was cited by 'Toys R Us' in its bankruptcy filing this week, with the digital rival's ability to reduce prices remaining unmatched by its traditional brick and mortar counterparts. 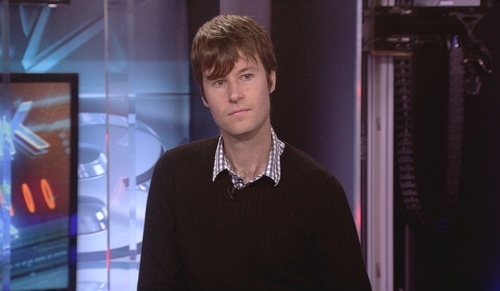 Mark Cummins is the CEO of Pointy, a company that helps local retailers get their inventory online. Using a small device, shop owners can digitize their store and automatically puts all store items online, allowing consumers to find them online. We work with anything. We take all the unstructured data, the device extracts it and we build up a digitized version of the store. He says 90 percent of commerce still takes place in local stores. An industry like that is actually quite resilient. Some of the big box retailers are maybe under pressure, but the local stores have never really competed that much on margin, they’ve compete on convenience and they still have a convenience advantage in many cases. Switzerland's foreign trade surplus totals 2.2 billion Swiss francs in August. Imports grew 6.5 percent on the year to 14.2 billion francs, while exports grew 6.1 percent on the real to 16.3 billion. 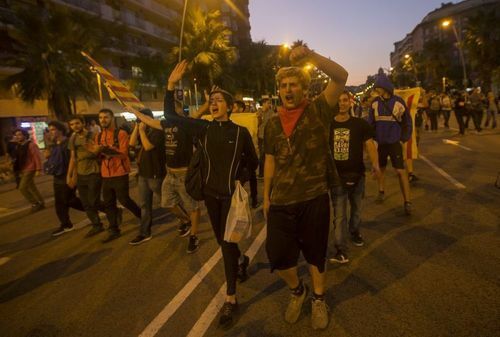 Protestors are arrested in Barcelona, after tens of thousands take to the streets to demonstrate against Spanish police raids of government offices, in a bid to block the Catalan referendum. 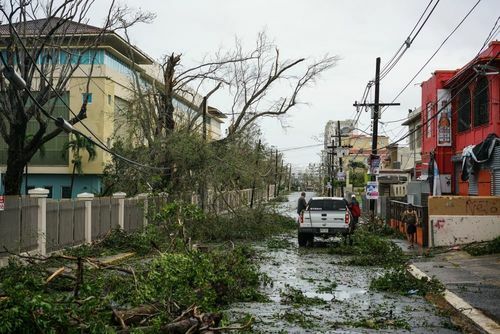 Hannover Re warns investors it may miss its profit target as insurers continue to count the cost of an expensive storm season, while Hurricane Maria batters the Caribbean. Capita reports that trading in the first half is broadly in line with expectations, while cost initiatives are on track to realise around £57 million of savings by the end of 2018. Underlying revenue declined by 3 percent during H1, but underlying profit before tax rose 46 percent to £195 million. Net debt at the end of June 2017 is down to £1.596 billion, from £1.901 billion last year. 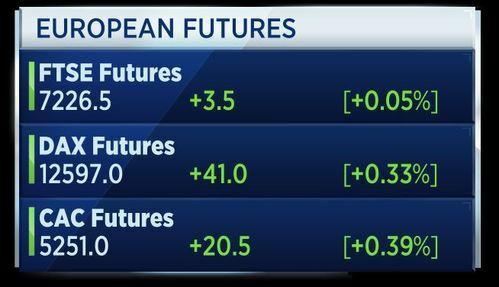 Here's a look at the opening calls for European markets. 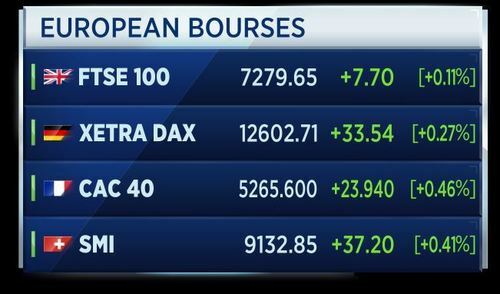 The French and German markets are seen making strong gains while the FTSE looks set for a flat open. Russia's central bank says it agrees to measures to improve the B&N Bank's financial stability. The central bank will become the main investor and will use funds from the fund for consolidation of the banking sector. The central bank says B&N, as well as Rost Bank, will operate as usual and meet their obligations. Bank of Japan's Governor Kuroda is giving a news conference following the BOJ's decision to hold rates. He says it is inappropriate to change the 2 percent price target; changes to U.S. rates doesn't mean Japan should also raise rates; he won't make changes to ETF buying based on stock prices; the bank will take additional easing action if necessary and will ease policy further if needed. 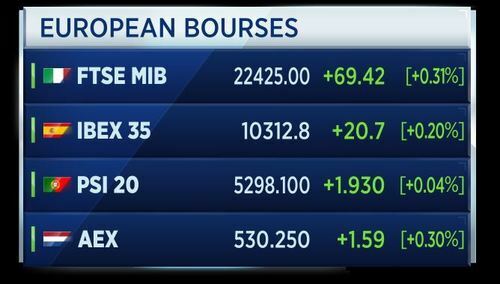 European markets rise, following on from a positive session on Wall Street. 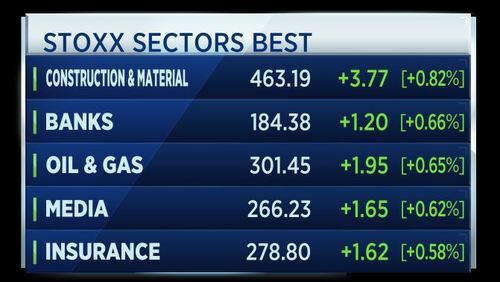 Here are the sectors leading European markets higher today. 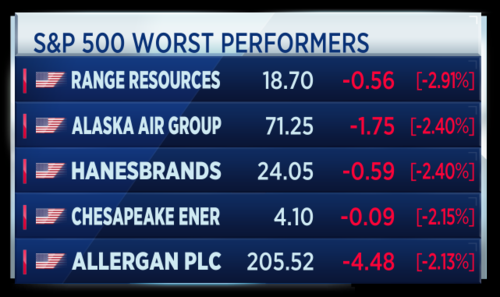 Basis resources and travel are dragging on the Stoxx 600 index. 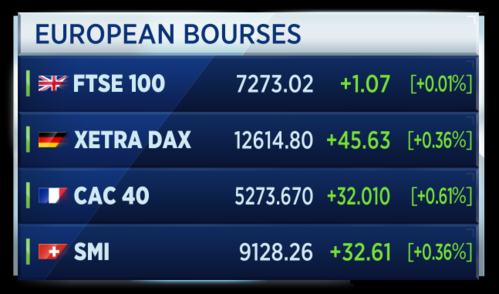 The individual European markets are all rising at the start of Thursday trade. Strong gains are being made on the Swiss and French stock markets. 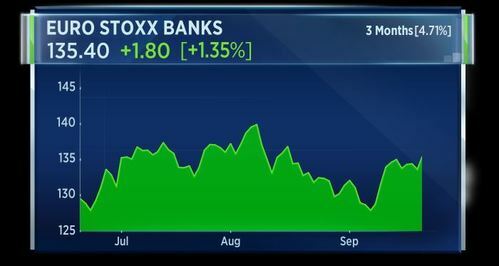 The European banking index has hit a 1-month high this morning. 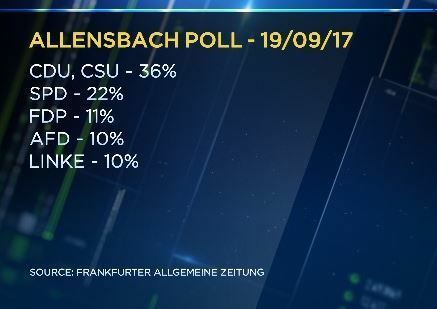 Altaf Kassam, head of research and strategy at State Street Global Advisors, tells CNBC how the upcoming German election this weekend could impact the sector. He says it could lead to a more constructive approach to the European Union. We could see some genuine regulatory and corporate mergers going on where you actually do open up the European banking market a lot more. So I think that could be important. 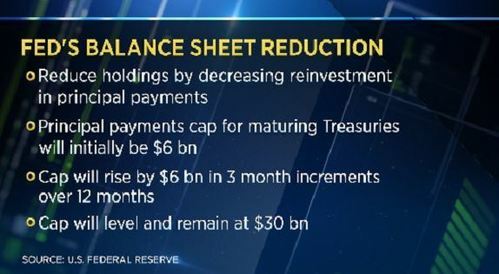 9 years and 4 and a half trillion dollars later - the Fed starts unwinding its balance sheet. Chair Janet Yellen sticks to the rate hike path, brushing aside the 'inflation mystery'. 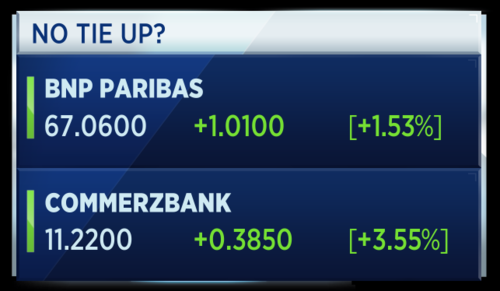 The Fed bank boost reaches Europe, as the sector hits a one-month high amid reports Unicredit is eyeing Commerzbank for a mega-merger. Anglo American shares jump after Indian billionaire Anil Agarwal ups his stake, making him the South African miner's top shareholder. China is appealing to the Trump administration to use the U.S. president's expected visit as a way to improve ties between the countries. Foreign minister Wang Yi met with Vice President Mike Pence on the sidelines of the UN General Assembly. He told Pence the conversations between Presidents Trump and Xi so far have been a "good start". Lei Jing, managing director and CIO of fixed income and institutional investments at Harvest Fund Management, says China is at a turning point in terms of the structure of economic growth needing to change. I think the government, what they are trying to achieve is more sustainable growth, rather than the quantity of growth. That was the prior history, but now I think the government is trying to do everything as possible to make sure growth is sustainable on a long term basis. 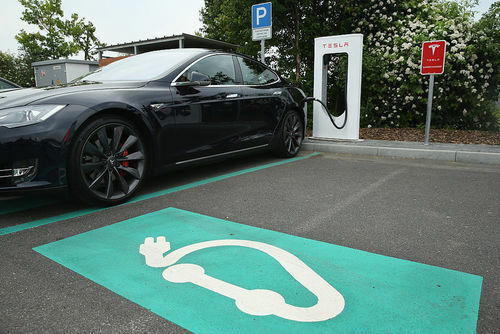 The electric car-maker Tesla is working in partnership with the semiconductor company 'Advanced Micro Devices' to develop its own A.I. chips for its self-driving vehicles. 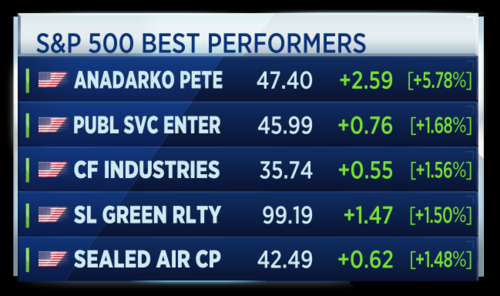 AMD shares rallied after CNBC broke the news of the partnership. The effort to build its own chip is in line with Tesla's push to be vertically integrated and decrease its reliance on its existing suppliers, such as Nvidia. Italy's largest bank, Unicredit, could be exploring a merger with Commerzbank. That's according to a report by Reuters. The combination would create one of Europe's largest banks and could come after Unicredit's two-year turnaround plan is complete. Both banks have declined to comment, though Reuters says Unicredit has expressed interest in the deal to the German government. 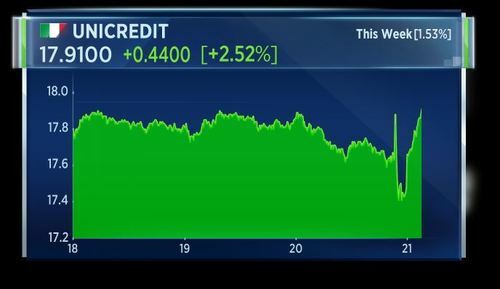 Unicredit shares are up 2.5 percent on the news. The Federal Reserve has pulled the trigger on unwinding quantitative easing. Chair Janet Yellen announced the central bank would begin reducing its balance sheet from next month. Policy-makers held rates steady but left the door open for another rise, with September's dot plot showing conviction for one more hike this year and 3 more in 2018. Yields rose across the board with the 2 year yield hitting its highest level since 2008. 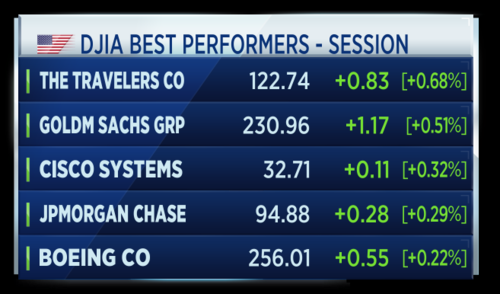 Financial stocks also got a big boost, with the S&P Financial sector rising to its highest close since the start of the financial crisis in 2007. 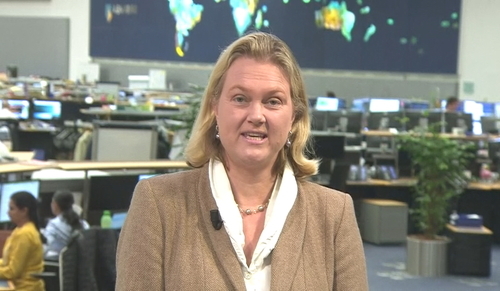 Mary Pieterse-Bloem, global head fixed income strategy at ABN Amro Private Bank, says the market is moving on the latest Fed developments. Although the market was not very convinced before, it’s getting more and more convinced. The one thing that we are not so convinced about ourselves is the fact that inflation, low inflation, is a temporary phenomenon. We’ve seen of course the uptick in inflation, but we are very much wondering still whether we are going to see stronger inflation going forward and that will be key for what the Fed will also be able to do this year. 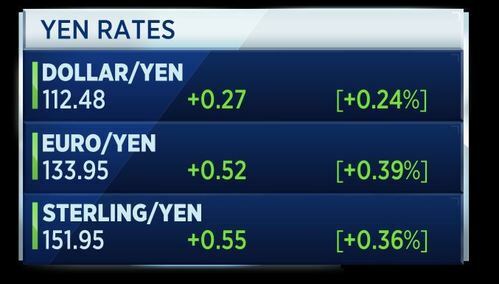 The Bank of Japan held policy steady in an 8 to 1 vote, expressing confidence inflation will reach the 2 percent target. That keeps its main rate in negative territory. One dissenter said current easing measures were not sufficient to boost inflation. 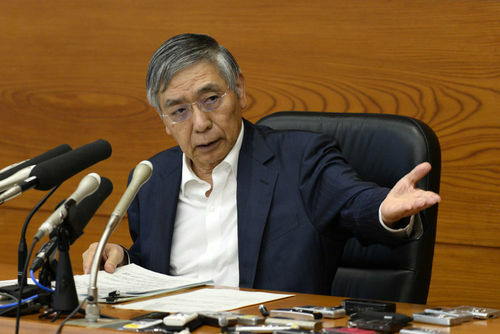 At a news conference, Governor Kuroda (pictured) said the Bank would respond as needed to any impact of the North Korean situation on the Japanese economy. 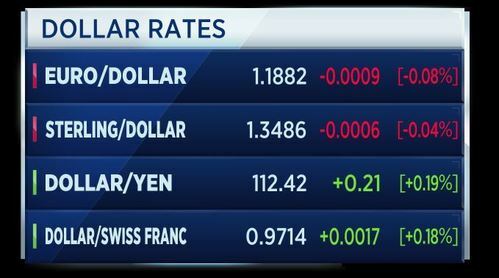 Other currencies are trading stronger against the yen following the decision. The Norwegian central bank has kept its key interest rate unchanged at 0.5 percent. The Norges Bank says there is a continued need for an expansionary monetary policy. 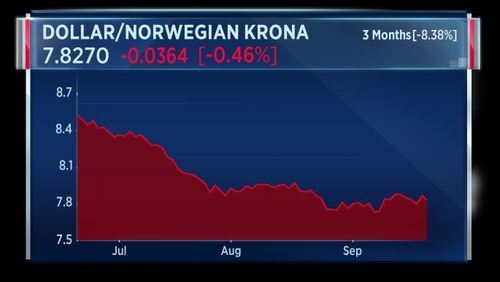 Norges Bank says the outlook for inflation is it will remain below 2.5 percent for the coming years. It predicts the rate remain at 0.5 percent over the coming year and rising gradually after that, which is a slighter earlier forecast for a rate increase than previously. The Norwegian crown is gaining broadly after this signal for a future rate hike. Ryanair's CEO tells the companys AGM that the recent string of flight cancellations was the "right operational decision", but admits the issue was badly handled. North Korea's top diplomat issued a disparaging response to President Donald Trump on Thursday, likening his United Nations speech to "the sound of a barking dog." In his first speech to the UN General Assembly on Tuesday, Trump said he would "totally destroy" North Korea if the isolated regime threatened the U.S. or its allies. If he was thinking he could scare us with the sound of a dog barking, that's really a dog dream, Ri Yong Ho, North Korean Foreign minister, told reporters near the UN headquarters in New York. 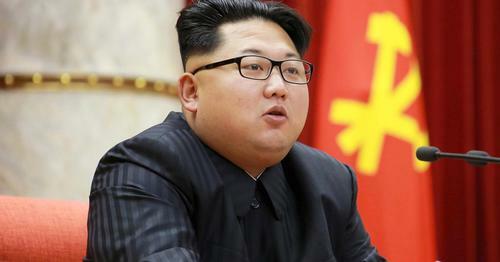 CNBCNorth Korea's top diplomat issued a disparaging response to President Donald Trump on Thursday, likening his United Nations speech to "the sound of a barking dog." RyanAir CEO says takes personal responsibility for poor communication of flight cancellations. Says has not received any letter from pilot committees demanding new contracts. The CEO says the 500 pilots due who have four weeks of leave in October may be asked to take final week afetr January 1st. That's according to Reuters. The Fed appears to be preparing the market for a hike in December. US yields and the dollar have jumped, which is typical of such Fed guidance. Ahead of previous hikes this year, the dollar has also been temporarily boosted in such circumstances. As for the balance sheet reduction announcement, the market appears to have shrugged it off. The US yield curve barely moved, stocks have been stable and EM markets have held up well (on a relative basis). It seems almost too easy for this to happen without a market reaction, so as the balance sheet reduction gathers pace over 2018, this is worth monitoring more closely. For the dollar, the larger question is whether the Fed is willing to go beyond guiding the market to a December hike to guiding the market to its dot forecasts in 2018 and 2019. Throughout its hiking cycle so far, it has avoided such longer-term expectations. 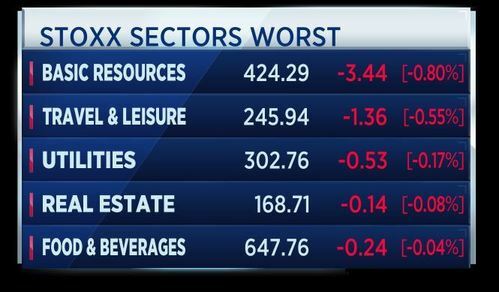 This has resulted in the actual hikes resulting in dollar weakness (Figure 1). Rates markets interpreted yesterday’s Fed actions in a manner similar to previous such moves (so not pricing much more hikes for 2018 than it had done before the meeting). This fits into our bearish dollar narrative. The dollar has already rallied significantly since tapering, in 2013, but from this year it has been weakening despite several hikes, as the focus shifts to other countries starting their hiking cycles. It is likely no surprise that the pound has barely moved against the dollar over the Fed meeting since the BoE is expected to hike. It is also notable that the dollar rallied equally against both the euro and yen, despite the latter’s stronger correlation to US yields. We would be cautious in writing off the ECB so soon. Overall, we remain comfortable with our bearish broad dollar stance. The S&P 500 and Dow Jones industrial average closed at record highs and bank stocks surged after the Federal Reserve indicated another rate hike this year was possible and that it would begin the unwinding of its balance sheet next month. The statement was a little more hawkish than traders anticipated, causing the 10-year Treasury yield to jump higher and in turn, boosting financial shares. Lufthansa is interested in acquiring as many as 80 planes from rival Air Berlin with its priority on securing planes it already leases, the group's chief executive said. That's according to Reuters. A creditor committee meets on Thursday afternoon to discuss offers for Air Berlin, which filed for insolvency in August after major shareholder Etihad pulled the plug on funding. Lufthansa is competing with several other airlines for parts of Air Berlin, including easyJet and Thomas Cook's Condor, with bidders especially interested in its Niki short-haul business that flies from Germany and Austria to holiday hotspots in Europe. S&P Global Ratings downgraded China's long-term sovereign credit rating by one notch on Thursday to A+ from AA-, citing increasing risks from the country's rapid build-up of credit. The downgrade reflects our assessment that a prolonged period of strong credit growth has increased China's economic and financial risks, S&P said in a statement, adding that the ratings outlook was stable. S&P's downgrade follows a similar demotion by Moody's Investors Service in May and comes as the government grapples with the challenges of containing financial risks stemming from years of credit-fuelled stimulus spurred by the need to meet official growth targets. Greenpeace says its activists have boarded a ship containing diesel VW cars being imported into Britain in the Thames estuary. That's according to Reuters. The president of Kenya has criticised a supreme court ruling overturning the results of the recent presidential election. During the televised speech, the president called the decision a "coup" against the will of the people. Gold fell to its lowest in nearly four weeks on Thursday as the Federal Reserve signalled it was on track to raise U.S. interest rates again in December, driving the dollar to two-month highs versus the yen. The metal is highly sensitive to rising U.S. interest rates, which boost the cost of holding non-yielding bullion relative to other assets, while lifting the dollar, in which it is priced. 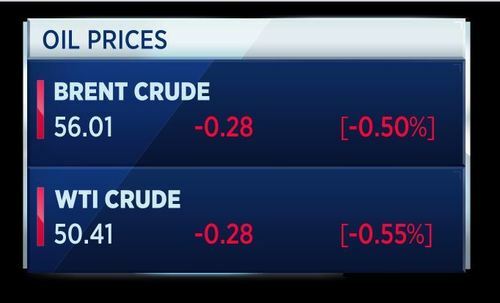 Oil markets dipped on Thursday, weighed down by rising U.S. crude inventories and production as well as a stronger dollar, which potentially hampers fuel consumption in countries that use other currencies at home. Brent crude futures, the international benchmark for oil prices,were at $56.13 a barrel at 0134 GMT, down 16 cents, or 0.3 percent, from their last close. 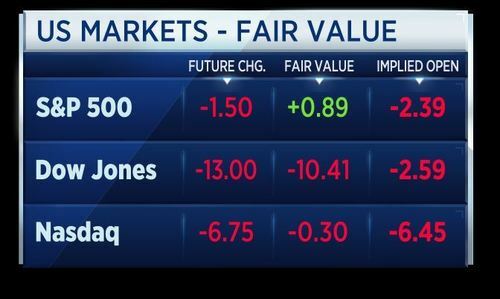 U.S. stock index futures pointed to a slightly lower open on Thursday morning, after the Federal Reserve opted to start shrinking its balance sheet and signaled one more interest rate hike this year. On the data front, initial claims and the Philadelphia Federal Reserve's Business index for September were both to be reported at around 8:30 a.m. ET, while the Federal Finance Housing Agency (FHFA) home price index and leading indicators are both due out later on Thursday morning. The German finance ministry has said that a media report about berlin favoring a merger between Commerzbank and BNP Paribas is NOT correct. The ministry has added that there is no time pressure to sell its Commerzbank stake. 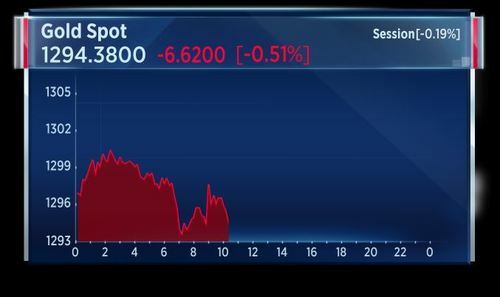 The report by WirtschaftsWoche sent Commerzbank shares higher by 5 percent but have since pulled back. Various media are reporting that Russia's B&N Bank could need between $4.3 and $6 billion rubles to cover bad loans. The country's central bank is bailing out the troubled lender. The dreaded phrase 'domino effect' has been uttered by the country's central bank. We realized that it’s better to isolate a bit more so that the domino effect does not arise, and according to the results of this work the domino effect is excluded, there is no risk of this. - Central bank chairman Vasily Pozdyshev to a local press conference. U.S. jobless claims fell by 23,000 to a seasonally adjusted 259,000 for the week ending Sep 16. The fall is considered surprising given the forecast negative impact of Hurricanes Irma and Harvey. Hyperloop One, a brand looking at a futuristic transport system, has announced that it has closed its B-1 series of funding to the tune of $85 million. In a statement to markets, the company said the total amount raised since 2014 is $245 million. Hyperloop said there are "advanced discussions" to demonstrate the technology with governments in Finland and the Netherlands. Currently there are feasibility studies for Hyperloop One projects in Dubai, United States, UK, Russia and the U.S. The dollar has held onto gains achieved after the Federal Reserve meeting last night. While the Fed's statement on Wednesday was widely expected, it was a little more hawkish than traders had anticipated. 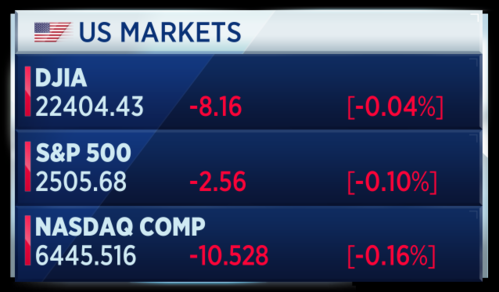 U.S. markets have opened for Thursday trade a little lower. Is this the trend as the era of 'QT' begins? The president of the European Central Bank Mario Draghi is speaking. 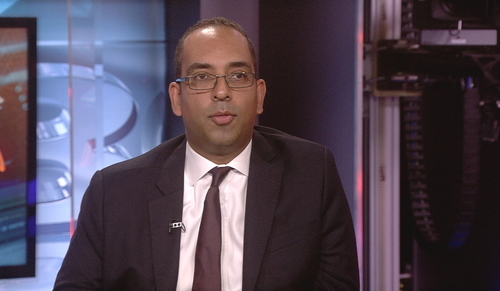 He has said the use of monetary policy is NOT the right instrument to address financial imbalances. The euro gained slightly ahead of the Draghji speech. 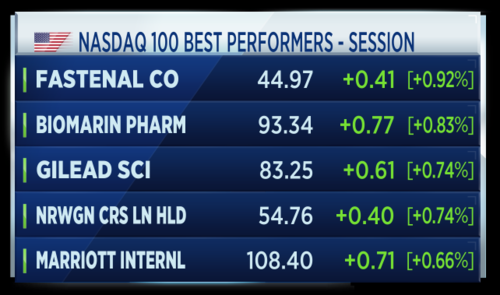 These are the biggest risers across the 3 main U.S. bourses. And these are the biggest losers. President Donald Trump has said that the United States will be adding more sanctions to punish North Korea for its missile program. There was no further detail. 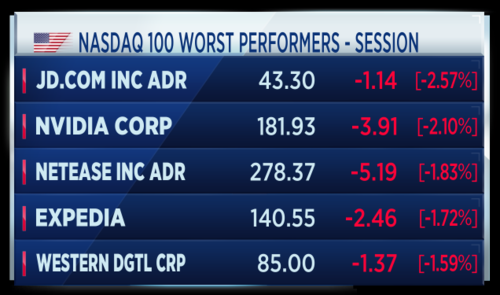 U.S. stocks have fallen slightly on Thursday after the Dow Jones industrial average touched a record led by bank stocks. Investors are now betting on another rate hike from the Federal Reserve by December. The Fed announced Wednesday it will begin rolling off its $4.5 trillion balance sheet starting in October. The central bank did not raise its benchmark interest rate from its current 1 percent to 1.25 percent target, however, its updated rate forecast showed that another hike this year is likely. 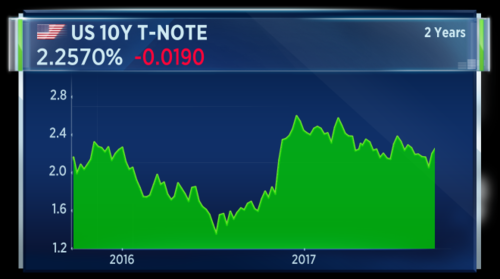 The announcement was a little more hawkish than traders had anticipated, causing the 10-year Treasury yield to jump higher. However, yields were steady to lower as trading began Thursday. One that could have ramifications for the multi-million soccer transfer system. 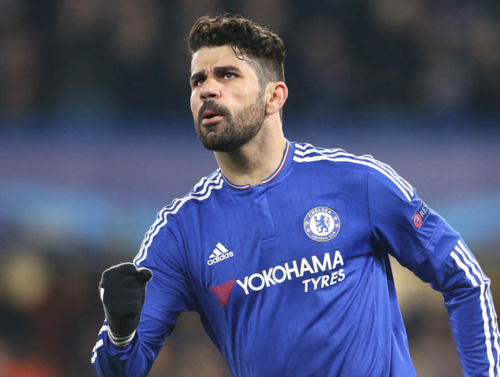 Chelsea Football Club in England have agreed to sell star striker Diego Costa to Spanish club Atletico Madrid. This after Costa simply refused to play and went home to Brazil demanding that Chelsea sell him. 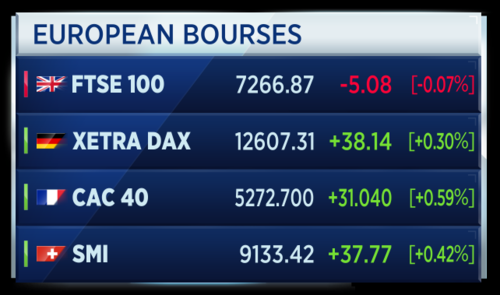 European markets are offering a touch of fight despite the negative and nervy start in the United States. The FTSE sitting flat however. 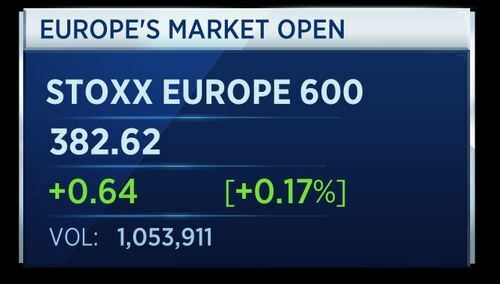 Europe's banking index led the gainers on Thursday, up around 1.6 percent at one stage amid reports of a potential merger. The German government is said to be in favor of a merger between state-backed Commerzbank and France's BNP Paribas, German weekly WirtschaftsWoche reported Thursday. The periodical cited financial sources unable to be verified by CNBC. The German ministry has since denied the report however. 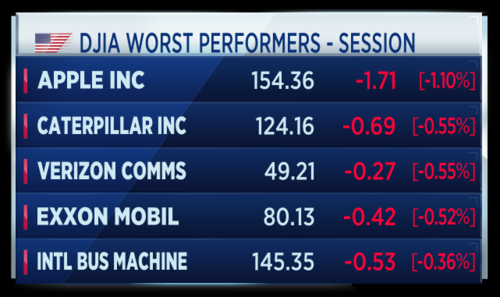 Apple is the biggest drag on the Dow today. Down for the second straight session. There are reports that the tech giant is struggling with connectivity issues on its new iWatch. 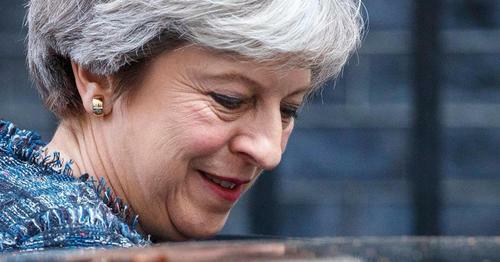 According to the BBC political editor the British Prime Minister Theresa May will say in a speech tomorrow that the U.K. will pay 20 billion euros to exit the European union. However it will demand access to the single market and some form of continued customs union during a transition period. 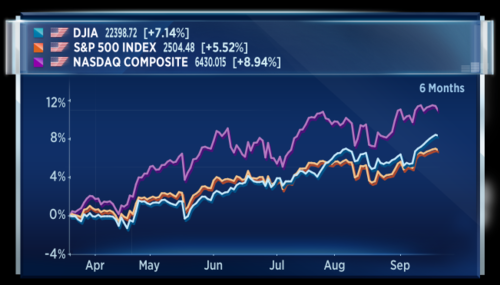 This is the six month performance of the U.S. markets. I'd say a number of people have been warning about a downturn during that period. Calling the top of this run has been a doomed venture. And that is the end of European trade, so that is where I will close the blog. Tomorrow we will hear from Theresa May on her plans for Brexit as she makes a speech in Florence, Italy. Some PMI data from France and the U.S. will be worth looking for and Angela Merkel's last campaign rally takes place in Munich. Until tomorrow, thank you and goodnight.